JARDINE Motors Group recently welcomed MP Stephen Timms to its Porsche dealership in east London. The former shadow minister for employment, who is the Labour MP for East Ham, was invited by the company to visit the Gallions Park showroom, where he met Jardine chief executive Neil Williamson and centre principal Ivan Howell. Over the course of the visit, the trio discussed business turnover, the number of employees and volume of cars sold. Timms met technicians and was shown a CitNOW video displaying the integrity and honesty of Jardine Motors Group and Porsche East London. He also took the opportunity to meet two apprentices and chatted about how they got into the automotive industry, what led to them being hired by Jardine Motors Group and the training they receive as part of the course. Williamson said: ‘We had a very productive meeting, discussing a range of important topics including the ever-changing state of the automotive retail industry and development of the electrical vehicle market. ‘Jardine Motors Group and Porsche East London pride ourselves on translating performance into success in the most intelligent way possible, be it by providing the best vehicles and service to our customers, or the highest level of training possible to our staff. The visit was organised as part of the National Franchised Dealers Association’s parliamentary engagement programme. 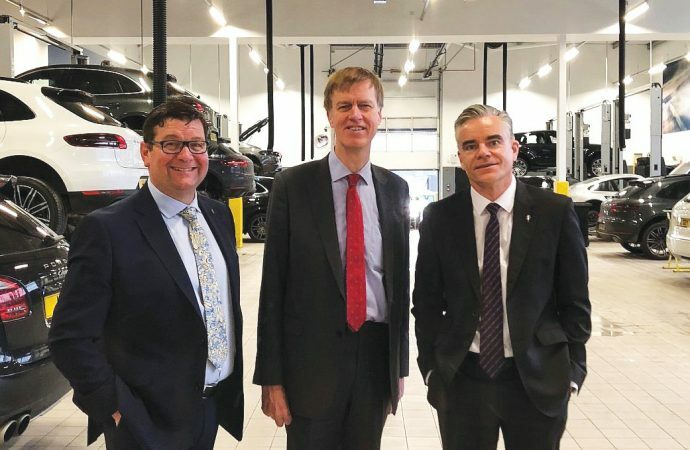 The initiative has been running for almost two years to raise awareness of the retail side of the automotive industry and lets dealers discuss key issues affecting their businesses with their MPs.